Forages furnish essential energy, proteins, vitamins, minerals, and fibers in livestock diets. Many factors (e.g. variety, maturity, growing conditions, handling practices, etc.) affect forage quality prior to the time it is fed. As a result, predicting forage quality values from standard books often grossly overestimates or underestimates feeding value. A better way to determine feeding value is to have a representative forage sample tested by a laboratory that uses proven and accepted methods of forage analysis. The first and most important step in obtaining a meaningful analysis is to collect a representative forage sample. This fact sheet describes proper methods for collecting representative samples. If one is not willing to properly sample their forage, the benefits of forage testing will not be realized. Equipment required for collecting forage samples includes a forage probe, a mixing bucket, and sample bags. If a forage probe is not available, sampling can be done by hand, but increased leaf loss is likely due to shattering. When sampling by hand, use shears or scissors to cut the sample into 2-3” pieces, then subsample the composite sample using the quartering method. Sampling with a probe is preferred since it is faster and a better sample is obtained. Several types of forage probes can be purchased from farm supply companies. Most are operated using a hand brace or electric drill (Figure 1). Some include a collection canister to make sampling faster. Probe design does not significantly affect sampling accuracy. The more important factor is to use the proper sampling method. Figure 1. 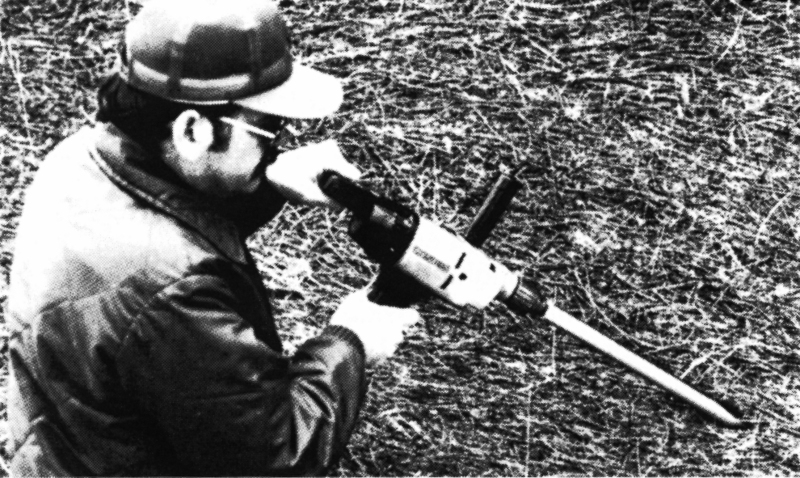 Forage probe mounted on an electric drill. Quarting is used to reduce a sample to a smaller, more manageable size in an unbiased manner. Prior to quartering, forage samples collected by hand must be cut into 2- to 3-inch pieces with shears or scissors and thoroughly mixed. Care must be taken to prevent leaf loss. Cored samples can be mixed as is. Pour the entire sample evenly into a pile on a clean surface, preferably paper, plastic, etc. Level the pile and divide into equal quarters (see diagram). Select and save two opposite quarters including the fines. If the sample is still too large, repeat the entire quartering procedure until the proper sample size is obtained. Always use the quartering method when reducing sample size to obtain a representative sample for analysis. Forage should be sampled as near to the time of feeding or sale as possible. Allow enough time for test results to be returned for inspection by a buyer or for ration formulation. Approximately two weeks should be allotted if submitting samples by mail. Samples take from one to five days to be processed by a laboratory depending on the tests requested, the methods used, and the overall number of samples received. July through October tend to be the busiest times of year for forage analysis. Some laboratories have very short turnaround times (an hour) when everything is analyzed by NIRS (near infrared reflectance spectroscopy). 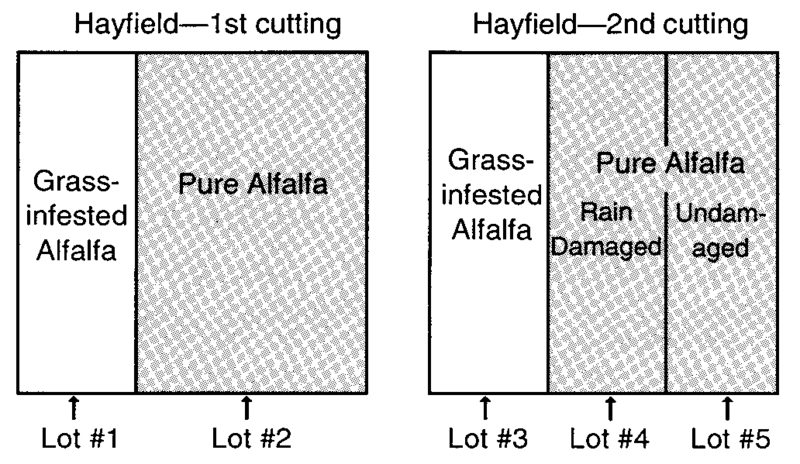 Extreme variation may occur in hay quality even when harvested from the same field. 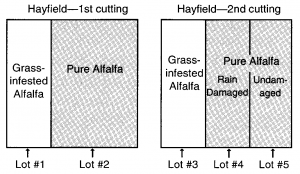 As a result, a separate forage sample should be tested for each hay “lot.” A “lot” refers to a quantity of similar forage. Factors to consider when determining lot size include forage species, stage of maturity, cutting schedule, soil type, soil fertility, presence of weeds, harvest conditions, storage effects, etc. 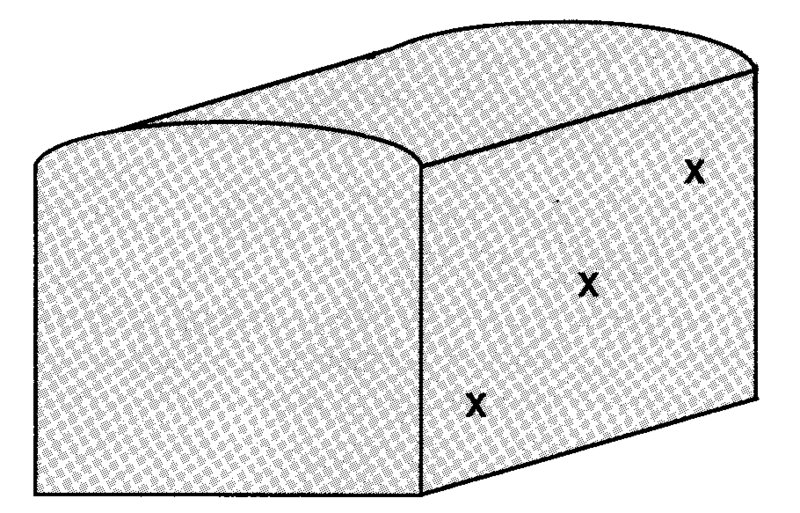 An example of how to divide hay into lots is shown in Figure 2. Quality differs in each lot causing differences in feeding value and/or selling price. Each lot should be sampled and tested separately. Figure 2. Selecting uniform lots of hay. Select a minimum of 20 average-looking bales for coring. Collect a core from each bale by probing into one end of the bale at right angles to the surface. Do not slant the probe at an up, down, or sideways angle. Combine the 20 cores in a bucket and mix thoroughly. To hand sample, reach inside each bale and remove one handful of forage. Be careful not to lose leaves. Cut the sample into 2- to 3-inch pieces. Combine all samples in a bucket and mix thoroughly. Small square bales are normally stored in a barn or under a cover, making sampling difficult. Some producers sample bales during or immediately after stacking. Others wait until near feeding time, then select representative bales from throughout the stack. The first method is acceptable if no damage occurs during storage, in which case the lot must be retested. The second method is also acceptable. Choose the method that satisfies your needs. Select a minimum of 10 representative bales and collect two cores from the circumference of each. Combine the cores in a bucket and mix well. Large round bales should be sampled to the center using a long probe or one with a extension adapter. Angle the probe in an upward direction to reduce the potential for water entering the core holes. To hand sample, reach inside each bale and remove two or three handfuls from different locations. Take care not to lose leaves. Combine the grab samples in a bucket after cutting them into 2- to 3-inch pieces, and mix well. Because round bales are normally stored outside and subjected to weathering, collect samples two to four weeks before the hay is sold or feeding begins rather than sampling immediately after harvest. Select a minimum of 10 representative bales. Collect two cores from each bale, one from each end, by probing at right angles to the surface. Use a long probe or a regular probe with an extension adapter. If a probe is unavailable, sample by hand as described for large round bales. Combine cores or grab samples in a bucket and mix well. Select a minimum of 6 representative stacks. Collect three cores from one side of each stack along a diagonal line extending from the top to bottom corner (Figure 3). The top sample should be collected approximately two feet from the top edge of the stack and the bottom sample approximately two feet above the ground. If a forage probe is not available, sample by hand as described for large round bales. Combine cores or grab samples in a bucket and mix well. Because hay stacks are stored outside after harvest, collect samples as near to the time of selling or feeding as possible (approximately two to four weeks). Figure 3. Recommended sample locations for a loose hay stack. Hay cubes or pellets are dense, bite-size hay packages. They are very susceptible to weather deterioration and should be stored inside. Because they are suitable for mechanized handling, cubes and pellets are generally dropped from an overhead elevator into a covered storage area forming a cone-shaped pile. Collect a handful of cubes or pellets from at least six locations around the pile and place into a bucket. Avoid collecting fines since they are only a small percentage of the total. Hay cubes and pellets are sometimes bagged. If a guaranteed analysis is not available, select at least six bags and collect a handful of sample from each. Combine samples in a bucket and mix well. Standing forage is sometimes tested to determine if it is worth cutting for hay or to determine if grazing animals require supplemental feed. Select at lease eight representative locations and clip the forage at grazing or harvest height from a one square foot area at each location. In grazing situations try and select the species being selectively grazed. Cut the samples into 2- to 3-inch pieces, combine in a bucket and mix well. Spread the sample on paper and allow it to air-dry for two days or place in a pan and dry overnight in an oven at 150 F before mailing it to the laboratory. Molding may occur if wet samples are mailed. Practically all plants contain measurable amounts of nitrates. Excessive nitrate accumulation can poison livestock as they graze or are fed hay. To identify nitrate toxicity potential, test samples for nitrate. Proper sampling is difficult however, since isolated areas in a field may be causing the problem. A nitrate test is only good for the bales or field location from which the sample came. Select bales from hay that is suspected of containing excessive nitrate. 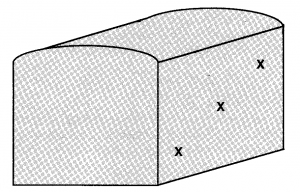 Sample the bales using coring procedures outlined previously. When sampling fields, clip at least 20 representative plants at grazing height from the suspected area. Cut into 2- to 3-inch pieces, combine, and mix well in a bucket. A qualitative field test, the diphenylamine test, can be used to determine suspect bales or field locations. This test indicates the potential for nitrate poisoning but does not give the amount of nitrate present. If excessive nitrates are indicated by the diphenylamine test, a sample should be collected for laboratory analysis. See your local OSU county Extension Educator for detailed information on the diphenylamine test. The same general care must be exercised in collecting silage samples as in collecting hay samples. Forage probes cannot be used for sampling silage, so one must rely on grab samples. The advantage of sampling silage as it is placed in the silo is that the test results will be known when the silage is ready to feed. When the moisture content of forage going into the silo is in the range of 64 percent to 72 percent, the test results of the fresh sample are very similar to those of the fermented product. Exceptions include silage that is heat damaged, moldy, or has undergone considerable seepage. Retesting is required in such cases. Remove two to three gallons of silage from different sections of a load and save about a quart using the quartering method. Freeze the samples until all loads are sampled. Combine samples, mix thoroughly, and reduce to about one quart by quartering. The final sample should be placed in the cloth forage sample bag, and the full forage bag inserted into a plastic bag to prevent moisture loss during mailing. Remove excess air from the plastic bag before sealing. Do not insert the plastic bag inside the cloth forage bag since damage may result when it is processed by the laboratory. Freeze the sample prior to mailing and mail samples early in the week to avoid weekend delays and reduce chances of molding. If a silo unloader is used, catch at least 12 handfuls of silage as it is discharged from the silo. Do not sample the top or bottom 2 to 3 feet in order to avoid unrepresentative, moldy, or otherwise damaged silage. Place the silage in a clean tub or other suitable container, mix thoroughly, and reduce the sample size to approximately one quart using the quartering method. Place the sample in a forage bag and mail as described for fresh cut samples. If an unloader is not used, the same type of hand grab technique can be used from the silage thrown down for feeding. Silage in the silo can only be sampled to the depths one can reach. The sample only represents that portion of silage. Other parts of the silo may have silage of very different quality. Horizontal silos can be sampled using the hand grab method as described for upright silos. The silo should be well-opened before sampling and care taken not to include spoiled silage from the top and sides. Grab samples should be taken from different areas across the entire surface of the open face of the silo. Combine samples, mix thoroughly, and quarter to reduce the size to about one quart. Samples can be submitted for analysis by the OSU Soil, Water, and Forage Analytical Laboratory through the local county extension office. The county office will provide sample collection bags and either loan a forage probe or provide information for ordering one. Completely fill the forage bag with sample (approximately one quart) and mark the attached tag in pencil with all appropriate test and sample information. Comments or observations about the sample or sampling conditions can be noted directly on the tag. The tags are returned to the sender with the test report and will provide interpretive information when consulting with the Extension Educator. Avoid using pens or markers when writing on the tags since these tend to smear or run if the sample is moist or the tag gets wet. Results are reported on a wet, as fed, and dry matter basis. For accurate moisture determinations, special submission procedures are required. Place the forage sample inside the cloth bag, then place the full cloth bag within a plastic bag. Press the sample firmly to remove excess air, and seal the plastic bag. A plastic bag is not necessary if the sample is already air dry or the sender is interested in results on a dry matter basis only. Never place a plastic bag inside a cloth bag since damage will occur during processing. Other questions about submission procedures can be directed to your local county Extension Educator.